Me: Can you stick the address label over the existing address on the parcel please. I’ve just reused old packaging and it will be confusing otherwise. Post Office worker: Oh we don’t produce address labels, just the postage label. Me: OK, can I buy some sticky labels then to put over the address? PO worker: We don’t sell sticky labels. 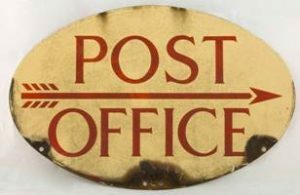 Me (slightly taken aback): But, but, you’re a post office. Surely you sell them? PO worker (shrugs): We never have. I can give you a scrap of paper and some tape to stick over it if you like? Me: Well, yes please – otherwise it will go to the wrong place. Can I buy a biro to write on it? PO worker (grips own pen a little tighter): We don’t sell them. Me: I, but, post office, thought, erm, can I borrow yours? PO Worker: Can I ask who provides your internet service at home? Me (naively): You can but, why? PO worker (eyes lighting up): Ah because we now offer a range of internet services, including latest optical fibre cabling at very competitive prices. We even offer insurance, mortgages, credit cards and more. We’re not just “the Post Office” anymore! Me: Well, if you don’t sell pens or sticky labels or produce address labels don’t you think you should just work on being a better post office for a bit longer? PO worker (snatches back pen): Have a nice day. NEXT! A while ago I asked my Facebook friends if they had to recommend one book (an almost impossible task, I know) which it would be. As I am aiming to increase the variety of what I read I summarised the responses and am slowly working through them (not to the exclusion of my usual choices though). What a great list it is turning out to be – which is no surprise given the erudition of my friends who span the globe. I thought others might like to see the list too. I hope I didn’t miss any, apologies if so.